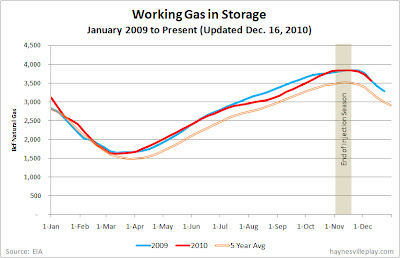 The weekly EIA working gas in storage report showed a 167 Bcf net withdrawal, bringing the gas in storage level to 3.561 Tcf. The weekly withdrawal falls between last year's (-186 Bcf) and the five year average (-153 Bcf). The current storage level is 35 Bcf lower than last year's (record high) level but 321 above the five year average. Temperatures across the country were 5.3 degrees below normal and 1.6 degrees below this week last year, with the largest negative variance reported in the South Atlantic region, where the average temperature was 12.1 degrees below normal, yielding 53.4% more heating degree days than normal.